Welcome to Grey Horse Matters. This blog will address issues facing the aging rider. 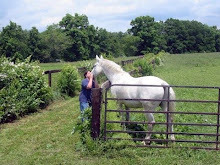 I will try to address the challenges of aging with our horses with sympathy, support and humor. This blog will also feature my interests pertaining to all horses and information I think might be helpful to all equine enthusiasts. In general, anything that I find amusing, helpful, insightful or just plain catches my attention or is fodder for thought or inspiration. I hope you will join me as I muddle through on my way to being a better horsewoman. DVD Review-"If Horses Could Speak"